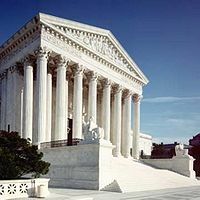 The Supreme Court of the United States (SCOTUS) is the highest court of the judiciary of the United States of America. Alexander Hamilton originally described the federal judiciary as the "least dangerous branch" due to the fact that it does not have the power to enforce its rulings, or control the country's finances. However, due to liberal tendencies the Supreme Court has grabbed so much power in the last half-century that it currently exceeds the authority of the other branches of government. Starting in 1791, the Supreme Court met in the Old City Hall building in Philadelphia. The size of the court was set at nine in the Judiciary Act of 1869. Between 1800 and 1935, it met primarily in the basement of the United States Capitol building, then in the Old Senate Chamber, until it moved into its present location at One First Street NE, Washington, D.C.
By custom, the Court is composed of eight Associate Justices and one Chief Justice. To assist them there are many clerks, guards, and staff. Cases are heard en banc whenever the Court is in session. Historians generally divide Court history into eras named after the Chief Justice then presiding (e.g., the Rehnquist Court and the Warren Court). Justices are appointed by the U.S. President with the advice and approval of the U.S. Senate, which means that confirmation by a vote of a simple majority of the Senate is required before one can be sworn in as a Justice of the Supreme Court. A list of pending cases to be heard on their merits by the Supreme Court, also known as petitions for which certiorari has been granted, is available on its website. Prior to the Marshall Court, the Court issued opinions in seriatim. This means that each Justice wrote his own opinion and delivered it from the bench. Currently, the Court issues one opinion, said to be "the opinion of the Court". Opinions tend to have the history of the case, followed by the Court's reasoning and action. Generally the opinion will be written by a member of the majority, chosen by either the Chief Justice or the most senior Justice in the majority. When a majority of Justices agrees to the opinion, it is called the majority opinion. Occasionally, a majority of Justices agrees to the remedy, yet a minority of Justices agrees with the main opinion. This is called a plurality opinion. Justices that disagree with the Court's action can and frequently do write dissenting opinions, which state their objections to the ruling. When a Justice agrees with an action, but not the reasoning behind it, he may write a concurring opinion, which states the reasoning he would have used. Such opinions have no bearing on the case at bar, but are often used later in time as justification for legal rulings. How judges became more conservative (moving up) or liberal (moving down) over time. Click to enlarge. Four of the five most conservative justices to serve on the court since 1937, out of a total of 43 justices, are on the court right now: Chief Justice John Roberts and Justices Antonin Scalia, Clarence Thomas and Samuel Alito The fifth was Chief Justice William Rehnquist, whom Chief Justice Roberts replaced in 2005. Looking at votes in divided cases on ideologically charged issues like criminal procedure, civil rights and the First Amendment shows Justice Thomas, the most conservative justice. He voted for the conservative position in those cases 82% of the time. Justice Marshall, the only other African-American to serve on the court, was by this measure the most liberal, voting for the conservative side 21% of the time. Thankfully, Scalia maintained a hard conservative position, consistently opposing liberals and their fruitless court positions. In ten of the last eleven appointments, the new justice was more conservative than the one replaced. ↑ Anthony Falzarano (2009). "18.What the ex-gay movement must accomplished to succeed", And Such Were Some Of You! One Man's Walk Out Of The Gay Lifestyle. Xulon Press, 223. ISBN 978-1606473863. ↑ see Adam Liptak, "To Nudge, Shift or Shove the Supreme Court Left," New York Times Jan. 31, 2009 Data from a 2008 study by William M. Landes, who teaches law and economics at the University of Chicago, and conservative Judge Richard A. Posner of the federal appeals court. Hall, Kermit L., ed. The Oxford Companion to the Supreme Court of the United States (2005) excerpt and text search, complete text online at many academic libraries. Hall, Kermit L., and James W Ely Jr., eds. The Oxford Guide to United State Supreme Court Decisions (2009) excerpt and text search, complete text online at many academic libraries.